Those words from my book, Good Things for a Full Life, were printed in January of 2013. Five years later, they are even more relevant. While technology has created many ways to reach out to others across the world, it has also created a world where one can feel isolated, disconnected and lacking real human interaction. People are craving human experience–the ability to connect personally with others, to feel an interaction was worth your time; to feel noticed and valued. How you think & feel about yourself in relation to others affects your relationships. Judgment builds a wall; openness requires courage. It’s imperative to pay attention to your words & thoughts, and how you “land” on others. Being “Earnest”- present and sincere with others is critical to making real connections with others. 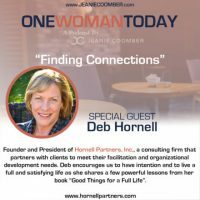 Let me know what resonates with you from this podcast, and any tips you have for making connections in our disconnected world.